A first class service! Willing to listen, whilst at the same time challenging the thought process to help drive the best outcome. Market Avenue Ltd is responsible for my company branding and marketing strategy. To date, we have had a first class service and a great strategic partnership. Friendly approach with an organised manner which made it clear on how to move forward easily and quickly. Market Avenue Ltd has worked with us now on multiple times, creating content for Social Media as well as Script Writing for Animation. The work we have tasked them with has ranged from creative to corporate and they have tackled both challenges with equal success. The variety, passion and professionalism makes them a pleasure to work with and we will certainly be back again. Market Avenue Ltd did a great job on our ebook from inception to sign-off. Anna has come up with something that we are proud to offer to clients on our website. I would recommend Market Avenue to anyone that want creative, persuasive copy delivered in a friendly and fun way. Whether that’s an ebook, blog, social media post or website copy, this company is what you have been looking for. I needed some content for my newsletter, so approached Market Avenue to see if they could help. I had a response the next day (Wednesday) and received my first draft of content on the next Monday. I was extremely pleased with the work, and it needed very few amendments. I would recommend Market Avenue to any business. My objective for Anna was to revamp my website portfolio…she overcome this by undertaking a specific introduction about how holidays/travel make you think and feel. For example; Linking certain aspects of travel to movies – the cold crisp bite of the winter mountain air as you cruise down an elevated European piste? The adrenaline is pumping with the thrills of excitement – you feel like you’re right in the middle of a Bond movie! (Brilliant)! Would I recommend Anna – oh yes without a doubt. She is very professional and her ability to tell a story is astounding… I have had amazing comments regarding my website, so one very happy customer! We have worked with Market Avenue for several years. It started with social media management and training but has progressed to the majority of our marketing needs including email, mail drop and mail campaigns, data cleansing, telesales and now a re-write of our website. We like to work in partnership with our customers and suppliers and we would certainly consider our work with Market Avenue as just that. Having worked with various other marketing agencies in the past, we would have absolutely no hesitation in recommending Market Avenue. They have consistently been responsive, professional and just a pleasure to work with. Market Avenue have been amazingly easy to deal with – a short and efficient briefing process lead to creative and targeted content for our social media channels. Highly recommended and I wouldn’t change a thing 10/10! Anna provided a great overview on Social Media and the power it has with some surprising stats! Her delivery and explanation of the content was very clear and concise and she confidently answered any questions from the delegates. The workshop gave serious food for thought on strategy, now implementation… Thank you! Working with Anna and her team has been like a breath of fresh air. I can breathe again, knowing that my social media has been taken care of and I can concentrate on “maintaining the conversations” rather than trying to create them. Without Market Avenue, my Twitter and Facebook feeds would be quite silent and this is not a good look when growing and running your business! We have been thrilled to work with Market Avenue during the past six years. Their enthusiasm, work ethic and drive has been invaluable to this company, skillfully guiding us through the many terrors and pitfalls of social media and marketing in general! They have become an essential part of our company going forward. 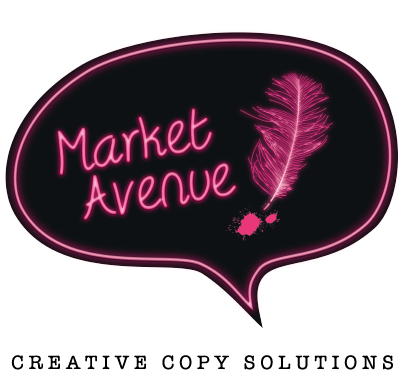 Market Avenue are an approachable and easy to work with company who provide Copywriting, Blog Writing, Social Media services and many more. We used them to provide copy for our somewhat sparse website – we received comprehensive copy which really helped explain our services. I would definitely recommend using Market Avenue – zero hassle and excellent output. Market Avenue delivered a series of blog posts, supplemented by a number of tweets to use to promote the blog. From the start of the project, Anna quickly grasped what we were looking for and the first draft blogs were perfect: free from errors, punchy and to the point. Exactly what we were looking for. We would highly recommend Market Avenue to any company seeking to get its message out there. Anna delivered a very friendly presentation full of extremely relevant information across several social media platforms. I now understand more about Twitter in particular; well worth attending. Anna created our marketing collateral from concept to print, we found Anna to be very creative and really connected with our product. Once the services were hired, Anna had tight deadlines and a unique brief with which she delivered on time and on budget. We will be using Anna again in the future as her committed and thorough approach enabled us to deliver a new marketing and online strategy within a very tight deadline. Thank you. The posts look fantastic! There’s a great mix of product recommendations and generic interesting posts. Just the tone we were hoping to try too. Awesome, I wouldn’t go anywhere else or recommend anyone else – you are my forever copy person! The training was a thorough, informative tour of the social media world and Anna was an excellent, knowledgeable trainer. Just a quick note to thank you for yesterday’s session, which I found very interesting and informative. Very informative and covered everything I wanted, learnt a lot. Thank you very much.